The ever-great importance of diet is multiplied many times during pregnancy. If children are to be born healthy, mothers can not be starved. If we accept this fundamental, the rest of our course is easy. The mother needs not only the amount of food necessary for her own sustenance and to keep up her own bodily functions, but also a very large increased amount for the growing child. The food of the expectant mother must be real food. There is no place during the period of pregnancy for the ornaments and finishings of the menu. Every mouthful that she eats should be adapted to the purpose of real nutrition and not merely serve to tickle the palate, or to comply with the follies of fashion. To this end the diet should exclude practically all desserts. These are not so harmful in themselves as they are in taking the place of the necessary things. Cakes, ices, sweets, pudding, and other such accessories are to banished entirely from the table. It is desirable to omit from the diet during pregnancy tea, coffee, and chocolate. If the craving of the mother is great for these stimulants, then the least harmful of them should be chosen, namely cocoa or chocolate. The more milk the preparation contains, the better for the mother. The breakfast should always have a fruit; the particular kind is not so important. It is well to interchange them, having a citrus fruit one day and a malic fruit the second day. Apples, pears, and peaches are examples of fruits in which malic acid is predominant; oranges and grapefruit are examples of fruits in which citric acid is predominant. After the fruit a bowl of cereal ground from whole wheat or whole Indian corn or whole oats is to follow. The bread for breakfast should be baked from whole-wheat flour or whole Indian corn meal. For luncheon, the bread used should be of the same kind as that for breakfast. In addition to this a fresh egg, best coddled or soft boiled, or a lamb chop with a steamed or baked potato carefully cleaned before cooking and eaten with the skins with milk for a beverage is advised. For dinner the bread and milk are the same character as for breakfast and luncheon. A small piece of roast, preferably of beef or leg of mutton or lamb, with potato and one other vegetable, will be added. Vegetables have little value as food, but great value as regulators and they contain an abundance of minerals and vitamins. A salad, best of lettuce or fruit, will make up the dinner. I am wholly opposed to alcoholic stimulants, once commonly recommended during pregnancy and motherhood. I suppose it can not be denied that these stimulants do add to the appetite, but a healthy woman does not need any stimulus for her appetite while her child is growing. As to the quantity of the diet, it has already been intimated that it must be greater than that for normal conditions. The average woman of 130 pounds engaged in the ordinary duties of the household and taking the proper amount of outdoor exercise, requires food to furnish about 2250 calories a day. In the beginning of pregnancy an amount of food should be taken to increase this number by at least fifty a day at first, and soon by 100, 150, 200, 250, and finally 300 or 350. For about a month or three weeks previous to the birth of the child – as the attending physician will indicate – the mother’s diet should be diminished. The child is then fully formed. This will be no further great drain upon the mother and the burden of nutrition is lessened. It would be well if immediately prior to the birth of the child the mother’s diet should be reduced almost to the normal for her ordinary state of health. This precaution will aid the mother to bear the pain and burden of childbirth better than if she were fully fed up to the very moment. I need to show this to a young mother, to see how it compares to what she has been told in the 21st century! “Vegetables have little value as food”? My, how times have changed! That caught my eye, too! I think that “little value as food” means that vegetables had few calories, since the article did mention that vegetables contained vitamins and minerals. Weird. 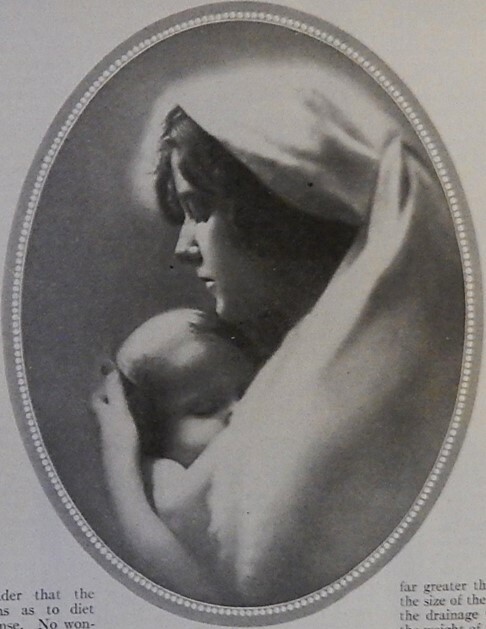 I’m just so glad I’m not an expectant mother of a 100 years ago. I wonder if there’s something to this ‘fully formed’ stuff. I didn’t think they were until about 21–22 years later. I am, too. Childbirth was so much more dangerous back then. Are we ever “fully formed”? I feel like I’m forever changing in one way or another. That is interesting, especially recommending whole grains and not drinking coffee, which is true today. It’s interesting how some of the advice is the same (and some different) across the years. Interesting enough the diet isn’t too far off from my daughter and daughter in laws diet of today. Probably the difference is the vegetables.. daughters were advised to eat greens like kale ,string beans,and reds like tomatoes,peppers,and orange as in squash….corn ,peas and sugar were to be eaten lightly as these contributed to a fat baby. Something both young mommy here didn’t need as their babies are all big .. 9lbs to 10 lbs. It’s interesting that some vegetables are considered better than other vegetables. This is so interesting. Along with what others have already mentioned, I’d never heard of cutting back on food for the last month, although perhaps it makes sense. I wondered about that, too. Cutting back on food towards the end of the pregnancy seems like it might be one of the bigger differences between then and now – though I really don’t have any idea what expectant mothers are told. A lot of it makes sense, but I’ve never heard that there was a time (referred to in the past tense in this article) where “alcoholic stimulants” were recommended during pregnancy! I’ve always thought that common sense is the best guide for health, as the rules for healthy eating are constantly changing. They must have known less about the effect of alcohol on fetuses in days gone by. Interesting details and so glad they advised women to stay away from alcohol! Based on several short stories that I’ve read in hundred-year-old magazines, I think that there was it was a stereotype that the lower socio-economic classes were more likely to use alcohol when pregnant (and to give alcohol to their children). I remember reading a story about a doctor who volunteered at a settlement house and how he lectured the young mothers about how alcohol should NOT be given to babies to make them them sleep better. Some things have changed for the better over the years. Exclude practically ALL desserts?! That’s a little harsh, but otherwise, the advice is reasonable and similar to what my OB advised me to eat when I was pregnant. As a Women’s Health NP, this is not too different from what I advise today. I’m not sure why, but for some reason it makes me feel good that the advice has been similar across the years. I guess that I won’t have wanted mothers back then to inadvertently eat in ways that weren’t good for them and their babies. It’s sooooo difficult not to eat a piece (or two or three) of cake after baking it. I don’t know why I’m always so surprised when I read all the good advice you post from 100 years ago. This is great advice! I always find it fascinating to see what has changed across the past hundred years and what hasn’t. I’m often surprised both by the changes and the similarities. This reminds me of a fictional story that I read in a hundred-year-old magazine about a doctor who advised mothers who came to settlement homes not to give their babies beer to stop their crying. Times sure have changed. Indeed, that’s a scary thought! A person can actually find quite a few beer advertisements from the 1890s up until Prohibition that are aimed at mothers with newborns. Some of them try to suggest that the nutritional qualities of beer would boost a mother’s milk production, but behind quite a few of them is the subtle suggestion that may mothers needed a beer. I’d have to think there’s be outrage at such marketing now.